Recently, the world lost one of the Children’s Literary Industry’s most recognised and iconic author illustrators, Narelle Oliver. Among many of the literary legacies she left us (you can read about her marvellous achievements and books in Joy Lawn’s post, here), she was a woman who encouraged and maintained sincere relationships with everyone she met, friendships rich and real. During last week’s reflection about her, two books found their way to me promoting further introspection on friendship, love, and loss. Molly and her close friend, Mae are about to embark on an adventure together, a train trip into town. They are filled with bubbly excitement, relishing each other’s company, sharing the passing of time until the train arrives and the telling offs by Mum as they scamper, bounce, hide and ballet the wait-time away. Like all little girls, they are so engrossed with their games and secrets that they are blissfully unaware of the wider world surrounding them on the platform. Their joie de vivre eventually spills into the carriage, over seats and under foot as the countryside slides away outside, until, after many miles, games become stale and tempers fraught. Delays halt fun and bad weather smears their vision, turning their friendship murky. A trip by oneself can be lonely, however and the girls miss each other in spite of their falling out or perhaps because of it. Eventually, as they near their destination, they cross bridges of a physical and emotional kind. Their journey takes them over hills, through valleys, sometimes running straight and true, other times navigating bends and tunnels, until together, they arrive, holding hands. 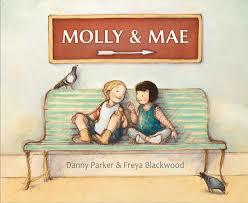 Molly and Mae is a wonderful analogy of friendship brilliantly executed by this talented picture book team. There is an eloquent sparseness about Parker’s narrative that harmonises each and every word on the page with Blackwood’s oil painted illustrations. The combination is intoxicating and terribly alluring. Blackwood’s visual story contains several signposts that guide readers through this warm and recognisable tale of friendship; transporting them through all the exuberant, boring, testing, dark, and illuminating parts of the friendship journey. Memorable, visually poetic, and beautifully written, this picture book is not only perfect for little people from four years upwards but also makes a gorgeous gift for those remembering and sharing friendships, past and present. I always feel a little conflicted with the idea of harbouring animals in unnatural habitats far from their original ones, from their norm. 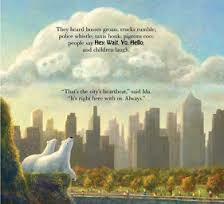 This picture book, however questions what is normal, learned and ultimately depended on and loved from a polar bear’s point of view. Gus lives in New York City’s Central Park Zoo. He is joyously unaware of the bigger city outside of his parkland world where zookeepers and visitors come and go and tall buildings form his boundaries. This is largely because he lives with Ida, his polar bear room mate. She is right there with him, everyday, always. They play ball together, splash in their pond together, chase and race together until it’s time to rest and relax as the city’s heartbeat hums around them. Their days seem repetitive and predictable but for Gus and Ida, they are all that they need. Until one day, Ida isn’t quite there. The city and zoo’s residents continue to shuffle and hum and rush and squabble but Ida can no longer join the raucous of daily living because she is old and has fallen ill. Gus struggles with this abrupt change, refusing to leave Ida’s side when she is too tired to play, insistent on helping her and making the most of ‘the laughing days’ they have left together, until one day, ‘Ida curls into quiet’ and is no longer there. In spite of his loss and grief, Gus continues, listening as the city pulses around him. In its rhythm, he feels its life, his own heart beat and Ida, right there with him, always. Touching, a little tearful but ultimately inspiring, Ida, Always was inspired by the real life relationship between two polar bears in New York. Apparently, not only Gus mourned the loss of his friend but also the entire city and all who had cared for and come to know them. Levis’s treatment of their story is heartrending and not overtly sentimental, allowing the reader to observe and understand the bond of friendship and love possessed by these two creatures who knew little else but the world, which their friendship created. By telling their story with subtle fictional flavour, sharing their thoughts, and hearing them speak, we feel an affinity with Gus and Ida that we might not otherwise have felt. The result is poignant and powerful, and enhanced beautifully by Santoso’s illustrations. 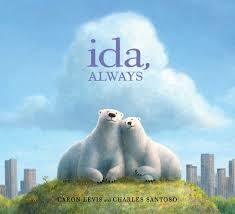 Ida, Always is a story about love, loss, friendships and how those we truly cherish remain with us, always.